The Front Range Back Country Horsemen (FRBCH) work behind the scenes, unknown to many trail riders and campers, to clear the trails, educate and to serve as advocates for horses on the trails. 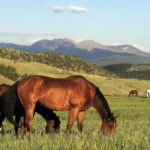 In more detail, their three main objectives as an equestrian service club are to keep the trails in the Mount Evans and Lost Creek Wilderness areas, as well as the Pike and Arapahoe National Forests outside of Denver, open to horseback riders and pack stock; to educate the public about various horse related topics such as camping with horses; and to act as equestrian advocates with local, state and federal governments. Whether you trail ride or not, it is critical to recognize the importance of the few groups that actively work to ensure the usage, safety and condition of the trails. New members of FRBCH are always welcome and will enjoy not only the comradery of the group, but will ride and camp in some of the most spectacular places on earth. Last September, several FRBCH members met to be re-certified as “sawyers” for the US Forest Service by Forest Ranger, Ralph Bradt. The certification took place at the south end of the Ben Tyler trail in South Park where the trail was in desperate need of clearing. They met in the morning, some with horses, although many did not bring their horses because of the Vesicular Stomatitis outbreak. 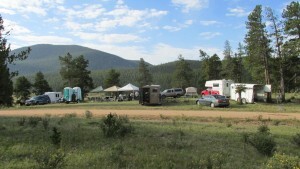 The group, Friends of Mount Evans also participated and many planned to stay and camp for the weekend. The certification included demonstrating all of the saw cuts the club uses in the forest to clear trails. FRBCH carries four different sizes of club-owned saws, including two 42 inch crosscut saws that can be used as two person saws and bypass loppers, used to cut back overgrowth. In the wilderness, mechanical saws are not allowed. Most members receive certifications for clearing down trees, while some are certified to fell trees and use chain saws. Every trip includes certified members to supervise the activities of those who are not certified. By the end of that weekend, they had cleared 64 downed trees and had received their re-certifications in preparation for this year. The busiest time for the FRBCH is late spring, summer and early fall. They meet several times a month with their horses, at various locations, to work on clearing the trails and making sure they are wide enough for a packed horse or mule to navigate. Trips range from day trips to camping trips, during the week and on weekends. Members participate in the trips when they can and they are typically ready to ride at 9:30am on work days. Some days involve quite a bit of tree clearing while others are light. On weekend trips, the group stays at the trail head to allow members to pitch tents or sleep in their trailers. On occasion, FRBCH brings along their club camp-stoves and everyone pitches in to enjoy breakfast and dinner together. In addition, many members are very experienced at camping with horses and packing into the backcountry and they are always willing to share their knowledge. One of the yearly highlights is the Colorado Trail ride that FRBCH hosts for members. This year the ride is seven days long, with one day off in the middle. By doing several segments each year, FRBCH completes the entire Colorado Trail in five years. It is a completely catered ride where a support team moves the camp daily, supplies and prepares all of the food for the people and horses. 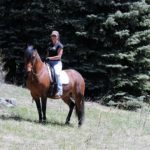 It is a great way to experience the Colorado Trail, get your feet wet backcountry camping with your horse with experienced packers and riders. This year the ride is July 18-26 and is broken into three segments, allowing people to do all 7 days (Platinum Membership, $780), 4 days (Gold membership, $480) or 3 days (Silver membership, $380). Visit the website for more details. Other services FRBCH provide are carrying water up to noxious weed spraying areas, building corrals, mapping trails with GPS and packing out abandoned camps for the US Forest Service. Furthermore, they have an Ambassador Ride to patrol the Christmas tree cutting areas on behalf of the US Forest Service and ride in the annual Parker Carriage Parade in December. 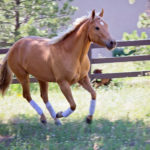 As advocates for horses on trails in the backcountry, some FRBCH members attend meetings held by local, county or state government when there is support needed related to the use of horses, access and parking, and whether trails in a particular area should remain open to horseback riders. Horse people attendance at these meetings is critical to show support in numbers for horse activities, alongside the hikers and bikers. Front Range Back County Horsemen holds monthly meetings for business and planning. Find the schedule and more information on their website, www.frontrangebackcountyhorsemen.org (or www.frbch.org), or call President Kitty Bladt at 303-984-2387 or Vice President Linda Baur at 303-670-3550. Please consider becoming a part of this fun, educational and important group! Heather McWilliams © 2015.